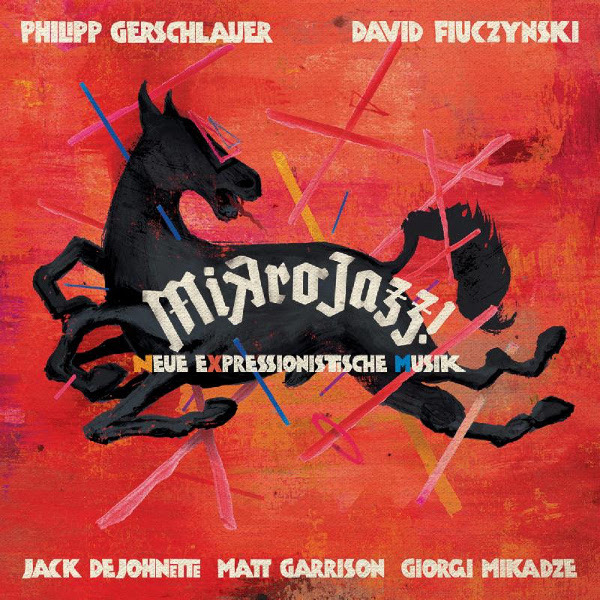 Last year saw the release of David Fiuczynski’s second album of microtonal jazz with global influences and collaborators. Flam! Blam! Pan-Asian MicroJam! was both a fascinating exercise and a musical success, and with MikroJazz! he presents another installment of the use of microtonal scales in jazz. This time out, his primary collaborator is German saxophonist Philipp Gerschlauer, who has developed techniques for playing microtones on his instruments. The rest of the ensemble consists of Matt Garrison (fretless bass), Jack DeJohnette (drums), and Giorgi Mikadze (microtonal keyboards). This album lacks the “Pan-Asian” flavor of its predecessor, opting instead for something closer to standard jazz instrumentation, though of course the microtonal melodies give it a flavor that is sometimes quite distinctive. Three of the tonal instruments here (saxophone, guitar, and fretless bass) are capable of minute variations in pitch outside the even-tempered scale, and we’ve all heard them do so in improvised solos — even a fretted guitar can bend strings to intervals off the even-tempered scale. But hearing them do so as deliberate parts of the main melodies is unusual, and would probably just sound like out-of-tune playing if it weren’t done so consistently and by multiple instruments in unison. The other distinctive factor here is Mikadze’s keyboards, which sometimes sound very different from normal instruments. He also makes extensive use of the pitch-bend wheel on his synth, which is not something you expect to hear on an electric piano sound. I suppose some listeners might be put off, unable to adjust to the different pitches, but most of the time, I find it refreshing. It’s kind of like encountering a completely new flavor in food, say the numbing taste of Sichuan peppers, and being put off by it at first, then coming to love it. I’m not sure I want it in every dish, but it is wonderful once you’re accustomed to it.